Sooty seems to be an utterly timeless character. He was around when I was learning my ABCs and he’s around now that Rowan is learning his. The difference between then and now though is that I didn’t have an educational, fun and exciting DVD to watch, full of cute mischievous puppets. 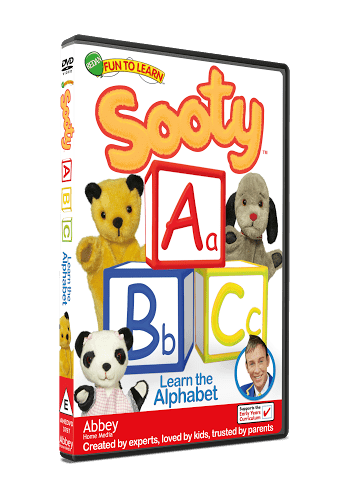 Preschoolers can now learn their ABC alongside Sooty, Sweep and Soo as they go on an exciting adventure. Once you’ve watched the DVD maybe you could set up your own little ABC adventure at home? adventure, is sure to appeal to his fans everywhere. laugh out loud comedy and humour along the way. If your child is learning the alphabet soon, or you know someone who would benefit from this wonderfully presented learn-a-long DVD, why not enter to win a copy of your own! All you need to do is complete the easy peasy rafflecopter widget below. Before you do – get your thinking caps on and cast your mind back a few years! I loved The Flumpsand bagpus! The Magic Roundabout for me too. just before the news. Oh, the moomins! I loved that! Bagpuss, then the Flumps and wombles. a programme called me and you. ….. that’s going back a bit, I still remember the theme tune! Gigantor, an American animated robot hero. I could still sing the theme tune today!